Guitar trek II : The family continues / Guitar Trek. This work was commissioned for Timothy Kain's unique ensemble 'Guitar Trek' in 1991 and was premiered by them at the Adelaide Festival in 1992. This ensemble uses the idea of a guitar "family" with instruments of different sizes and ranges. The Treble or Requinto is tuned a 4th higher than a standard guitar ie A'DGcea; the Baritone is tuned a 5th lower ie A"D"G'CEA. The piece is based on a five-note arch motive which appears in each of its five movements and is a synthesis of stories from the Aboriginal Dreamtime legends of the Rainbow Serpent. The work moves from the creation myths though to a depiction of a rainstorm at the end. Commission note: Commissioned by Guitar Trek. 1992: Adelaide Festival. 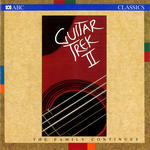 Featuring Guitar Trek.